Regular donations are important and will help us carry on raising awareness, supporting SCAD survivors, their friends and family, and helping to further research. You can donate via Total Giving, Just Giving, My Donate, Paypal and online shoppers can donate free via The Giving Machine, Easy Fundraising and Ebay. See below for more details. You can also complete our Standing order mandate to donate regular amounts. If your employer runs a Give as you Earn scheme, please consider choosing Beat SCAD as your charity! To donate to Beat SCAD using Paypal Giving, click the button. There are no fees when you use Paypal Giving – 100% of your donation will go to Beat SCAD. 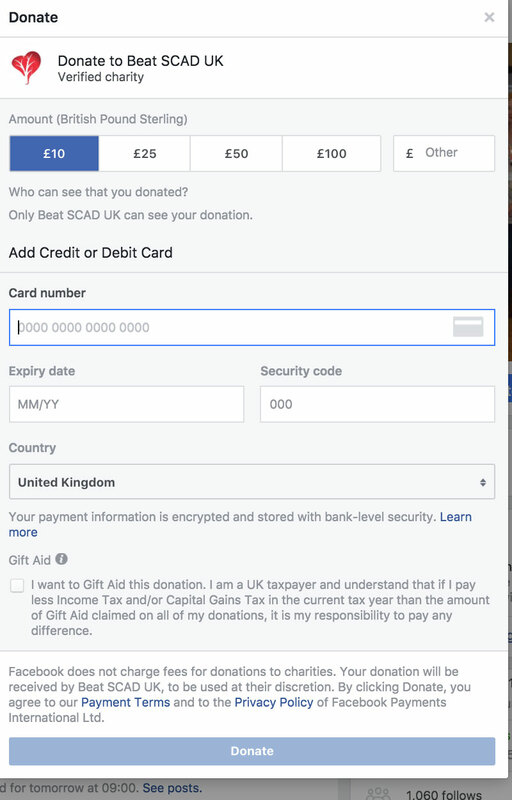 To donate to Beat SCAD using Virgin Money Giving, click the button. 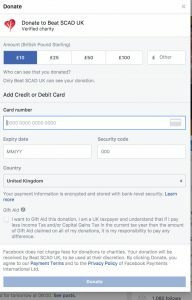 To donate to Beat SCAD using Paypal, click the button. Raise money using a Facebook post or donate via our Facebook page. 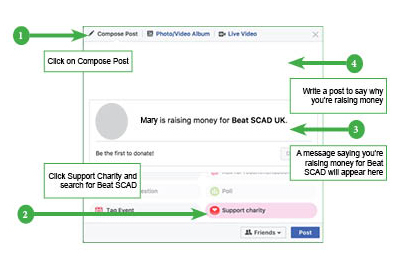 To create a post telling your friends and family you’re raising money for Beat SCAD, click on Compose post, then in the bottom pane, scroll to ‘Support charity’. Search for Beat SCAD and click to choose. 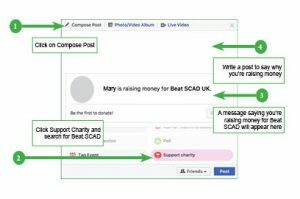 You will see a message in your post saying you are raising money for Beat SCAD. Finally, write a post explaining why you’re raising money and what your fundraising target is, and Post. To donate via our Facebook page click the Donate Button and complete the amount you wish to donate and your payment details. Send an e-card and donate the cost of cards and stamps to Beat SCAD. Click here to go to Don’t Send me a Card. To create a Total Giving page for a fundraising event, just click here and then click the ‘Fundraise’ button. We can collect Gift Aid via a Total Giving fundraising page and all the money comes directly to us. To create a Just Giving page for a fundraising event, just click the logo and then click the ‘Fundraise for us’ button. We can collect Gift Aid via a Just Giving fundraising page and all the money comes directly to us. To create a fundraising page in aid of Beat SCAD using Virgin Money Giving, click the button, then click on the ‘Start fundraising’ button. We can collect Gift Aid via Virgin Money Giving and all the money comes directly to us. Give free as you shop or exercise! If you shop online, this is a perfect way to donate for free! Every time you shop at more than 1,500 stores including Amazon, Play.com, John Lewis, eBay, Sainsbury’s and Next, you generate money for your chosen charity. All you have to do is click here to join The Giving Machine FREE! You can choose up to four causes and split your donations between them. Select Beat SCAD as a cause and specify the percentage of each donation you want to go to Beat SCAD. If Beat SCAD is the only cause you are selecting, please specify 100%. Install the ‘Shop&Give’ reminder via the menu on the left and every time you search for an online shop a message will appear telling you how much they will donate to your causes. Please note some stores, for example Amazon, require you to shop via The Giving Machine website; others allow you to shop directly on their own websites. Once you’ve signed up, please send invitations to family & friends to join too – the more you shop the more Beat SCAD receives! Donate for free each time you shop online! You can generate money for Beat SCAD using Easyfundraising, including Amazon, John Lewis, Debenhams, Clarks, Waitrose, Currys and loads more. All you have to do is click here to join Easyfundraising FREE! Select Beat SCAD as a cause and start shopping! Install the Donation Reminder and you can search for a retailer and shop easily via their online shop. Please note some stores, for example Amazon and Ebay, require you to shop via Easyfundraising website; others allow you to shop directly on their own websites. If you sell items on Ebay, you can donate a percentage of your sale price to Beat SCAD. Click here and here for more details. You can support Beat SCAD when you shop at Amazon Smile! Amazon donates a percentage of the purchase price on eligible products to a charity of your choice. Log on to Amazon Smile, choose your products and if they are eligible for a donation from Amazon, they will be marked ‘Eligible for smile.amazon.co.uk’ on their product detail page. Click here for more information. BetterPoints is a lifestyle reward programme that gives you points for being active, whether it’s cycling to work, walking to the shops or running for 10 minutes each day. Points are also awarded for activities that are good for your community and the environment, such as car sharing and using public transport. Bonus points are given as activity rewards, in addition to BetterTickets to participate in prize draws. Your points are converted to money that can be redeemed for vouchers to spend on the high street. Alternatively, you can donate some or all of your points to Beat SCAD – which means a FREE donation just for being active and staying healthy! To start earning BetterPoints, download the app from the App Store or Google Play, register and start logging your activity. The app is simple to use, your points soon add up, and when you’re ready to convert your points to money, just click the Redeem or Donate button in the app. When you click Donate, enter Beat SCAD in the Search all charities box then click on our profile and click Donate. You will be taken to the BetterPoints website to confirm the number of points you wish to donate. You can also Gift Aid your donation if you are a UK taxpayer so the charity can claim a further 25p for every £1 donated.